Harley-Davidson Road Glide touring motorcycle. A touring motorcycle is a type of motorcycle designed for touring. Although almost any motorcycle can be used for this purpose, manufacturers have developed specific models designed to address the particular needs of these riders. Touring motorcycles commonly have large displacement fairings and windshields that offer a high degree of weather and wind protection, large-capacity fuel tanks for long ranges between fill-ups, engines with a great deal of low-end horsepower, and a more relaxed, upright seating position than sport bikes. Particularly in the USA, touring motorcycles may be given names such as bagger, full bagger, full dresser, full dress tourer, or dresser. These monikers (often used disparagingly or jocularly) originally applied to cruisers with full sets of saddlebags or panniers such as Harley-Davidsons; but these terms may now refer to any touring motorcycle. Full-dress touring motorcycles are generally characterized by extremely large fairings and ample bodywork compared to other types of tourers. Hard luggage, e.g. panniers and a top box, are integrated into the design of the motorcycle which usually has a very large displacement, torquey engine with a very upright, comfortable riding position. 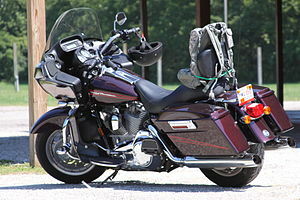 Additionally, optional amenities for full-dress tourers might include equipment not normally offered on other motorcycles such as complete stereos (AM/FM radios with CD players or MP3 connections), satellite radio, heated seats and hand-grips, GPS navigation systems, custom windshields, integrated air compressors, and air bags. Beyond what manufacturers supply, 'full dressers' are often customized by owners with additional accessories. Full-dress tourers are designed specifically for riding on pavement. A few examples of full-dress tourers are the Yamaha Royal Star Venture, the Honda Gold Wing, and Harley-Davidson Electra Glide. A recent type, the adventure touring motorcycle is a dual-sport motorcycle that allows long-range touring both on-road and off-road capabilities. Adventure tourers have high ground clearance (for off-road purposes), large fuel capacity, under-stressed engines for high reliability. They may have rugged GPS navigation systems, wire-spoked wheels with road-legal knobby tyres, skid plates (to protect the engine and transmission during off-road use), and tough metal panniers. Modified adventure tourers are sometimes used in gruelling rally events, such as the Dakar Rally. Adventure tourer models include the BMW R1200GS, the KTM 990 Adventure series, and Suzuki V-Strom 1000, and many others. Although most modern adventure tourers are large capacity bikes, that has not always been so: the first winner of the Dakar Rally did so on a Yamaha XT500. Sport tourers are a hybrid form of motorcycle between superbikes and tourers. Forming a niche market, sport tourers combine the performance of a sport bike with the long-distance capabilities and comfort of a touring motorcycle. They exhibit much greater emphasis on sporting performance (in both handling and speed) than conventional tourers. Although Honda has three sports-touring models, and BMW has four, most motorcycle manufacturers tend to have a single sport tourer, such as the Triumph Sprint ST or Yamaha FJR1300. Sports-tourers may have hard luggage as a standard fitment or as an optional extra. ^ "2009 Sport-Touring Shootout IV". Motorcycle USA. 9 November 2009. Retrieved 7 December 2013. This is Motorcycle USA’s fourth sport-touring comparison review. The one constant throughout has been the strong showing of the Yamaha FJR, winning twice (2004 and 2008) and finishing second once (2006). The BMW K1200GT claimed the top spot in 2006, dropping to third in 2008. The all new Concours made its ST shootout debut in 2008 where it finished second overall. This page was last edited on 30 August 2017, at 23:54 (UTC).